Desserts are my weak point, I’m sure its for most of you. So, it was quite a blow to me when I was diagnosed with gestational diabetes in my third trimester of pregnancy, oh yes, here’s the good news, me and Kalyan are now the proud parents of a 8 week old boy, Samiron Banerjee. Ok, so coming back to my sweet eating habits, so once the baby was I born, I am compensating for the lack of sweets in the last 3 months. I had been eating cookies, cakes, sweets – I mean anything and everything that is sweet. My friend brought me a bowl shrikhand, her own recipe and I loved it so much that I wanted to make it myself. The first attempt turned out awesome and I just couldn’t help but share this recipe with you all. 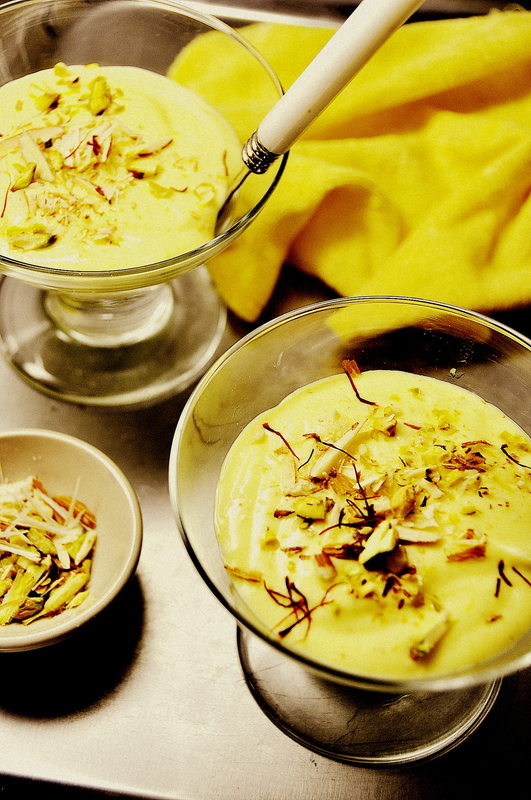 Shrikhand is a very popular dessert in Western India and some parts of Kerala. It is a yogurt based recipe, and the best part is it you don’t even need to turn on the stovetop to make this delicious recipe. Even though shrikhand is made generally with yogurt, which is hung almost overnight to drain out any excess water, I used kefir cheese, which is as dense as hung curd and the taste is the same. Chill in the fridge for 2 – 3 hours. Serve cold garnished with slivered almonds and pistachios.